Okay, there is a lot more than just keywords working on search ranking. Page view, pages indexed, overall site content, back linking, all work towards subject authority. You see the search engines' job is to answer the searchers' request for information based on the keywords present. The key for the search engines is to provide the "best" most appropriate information. So this review will be based on some other things other than keywords which may be able to assist this page to make it into the top 10. Some questions to ask: Does this page provide the best response to the keywords: coffee club? Is this page and site the authority on coffee club? 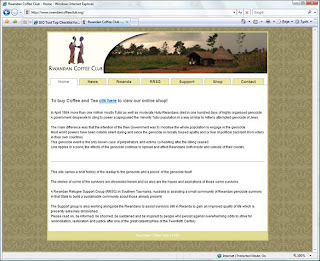 Well, reviewing the site it seems this site presents more information about Rwanda than coffee, which I believe is its purpose. In fact, a search for "rwandan support group" this page ranks number 1. As it would be a good thing to rank in the top 10 for coffee club as well, let's take a quick look at things which can be done. The number one page ranking for coffee club has a site with 348 indexed pages (google.com site:http://site/page) where as the page being reviewed only has a site with 28 pages of content. If you were to purchase a reference book, would you look for the big one? Well search engines do! Put as much relevant content up as you can and become the authority on the subject.